While I still need to finish writing my 2008 wrap-up and cover the music I've bought this year, I'll take a minute to cover the first few 2009 releases of note. Last Days - The Safety of the North: Continuing to mine the areas between ambient, post-rock, and electronic music, Graham Richardson has quietly built an impressive discography as Last Days. Both 2006’s Sea and 2007’s These Places Are Now Ruins are quietly compelling listens and The Safety of the North expands upon the success of those records. Richardson mentioned that this record is more cinematic in approach, which is quite evident from the fifteen tracks spanning sixty-six minutes and the addition of both spoken word excerpts and female vocals on a few tracks. I keep repeating “Life Support,” which reminds me of an ambient take on the interlocked melodies of Steve Reich’s Music for 18 Musicians. While I certainly wouldn’t mind if “Life Support” mirrored the album-long length of the Reich piece, I can’t wait to spend more time with the rest of the album, since other tracks like “The City Failed” and “Onwards” are also stand-outs. 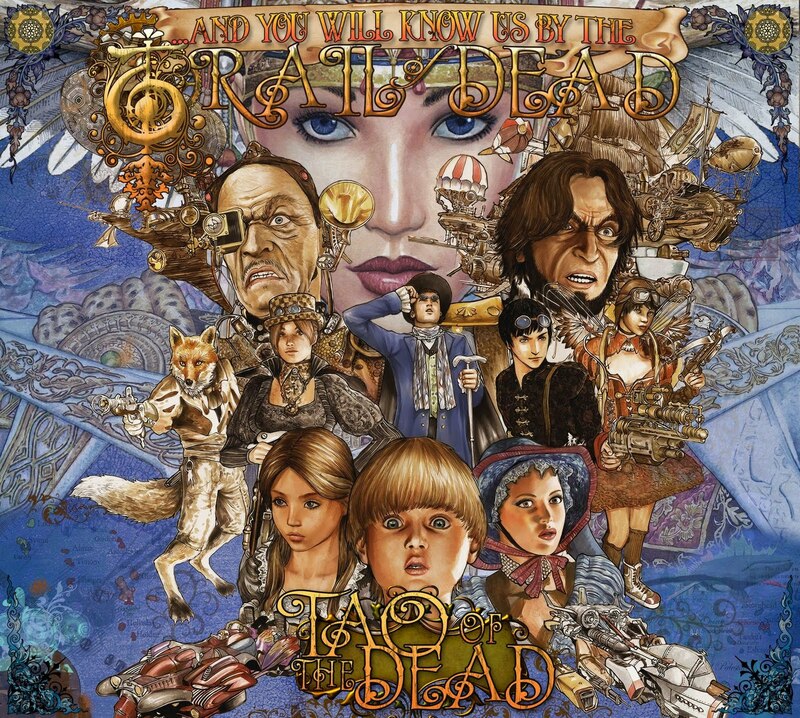 …And You Will Know Us by the Trail of Dead - The Century of the Self: The Festival Thyme teaser EP was just good enough to convince me to check out The Century of the Self, which I’d hoped would remind me of Source Tags & Codes but instead recalls the expansive prog-rock of Worlds Apart. Whereas Worlds Apart and So Divided seemed thrilled to deviate from expectations, The Century of the Self is lyrically consumed with returning to what was lost—cough, their direction, cough—but it’s often unsuccessful in mirroring that theme musically, falling prey to the same overblown prog-rock impulses. There are sections of this album that remind me of 1970s Genesis albums—having two piano-based “Insatiable” tracks, for example—which is an awfully strange tactic for any band to take. There has been some progress since So Divided, however. The first half of the album has a strong stretch from the energetic “Far Pavilions” to “Isis Unveiled” (recalling the Worlds Apart highlight “Will You Smile Again”), through the affecting bridge of “Halcyon Days,” but the album dips during the Festival Thyme rehashes “Bells of Creation” and “Inland Sea.” I’m a sucker for the maudlin surges of “Pictures of an Only Child” and the cathartic sing-a-long of “I’m the monster and I exist / And on this summit I am lost” on “Insatiable (Two),” but the canned strings of “An August Theme” are a laugh riot. The best thing about Trail of Dead is how they’re even compelling when they fail, which is more than I can say about a lot of groups. National Skyline - Bliss & Death: I approached this release with trepidation, since Jeff Garber’s recent track record has been less than stellar. It’s been eight years since National Skyline’s This=Everything, during which time Garber moved out to Los Angeles and Jeff Dimpsey retired from the project to take a remarkably similar approach with Adam Fein of Absinthe Blind in Gazelle. Year of the Rabbit was Ken Andrews’ baby, but Garber and Tim Dow’s talents were wasted in that watered-down version of Failure. The Joy Circuit was a mush-mouthed step toward U2-derived rock, which Garber already flirted with on a number of National Skyline songs. Garber released the three-song The Last Day EP to iTunes in 2007 under the National Skyline banner, which was an improvement on The Joy Circuit but more alt-rock than the old National Skyline. Bliss & Death received a similar electronic release in February. (No physical pressing is planned.) Bliss & Death isn’t quite a Garber solo record: Micropsia mentions that “Garber had the bulk of the album finished by May 2008, but felt as if some extra input were needed to give the record more texture. ‘I began to feel like this record was closer to my first band, Castor, and one of the most important things about Castor was Derek Niedringhaus’s bass playing.’” Mixed signals to be sure—who adds bass lines at the end of a record—but the Castor mention piqued my interest. I thought he’d forgotten about that group entirely. You can safely disregard the Castor reference, since there’s little here that remotely emo; this album is all about guitar textures. Garber seems to be in love with an acoustic-guitar-addled shoegaze approach, which unfortunately lends itself to some languid songwriting when the pace drops. It took me a few tries to make it past the titular instrumental, the tired “Edge of the World,” and the inexplicable single “Revenge,” but the rest of the album picks up the pace. “Bloom” does just that with a thousand guitar overdubs, “Glimmer” recalls the Edge-aping energy of those older National Skyline albums, “Driving Down” features both shimmering guitars and vocal hooks, “Kingdom” pays off its gradual build-up with an ascendant rush, and “I’m a Ghost II” is an excellent closing instrumental with a solid Niedringhaus bass line. While I’m impressed by Garber’s guitar work on many of these tracks, too many of his vocal lines drift aimlessly above the mist, lacking the solid hooks of Castor and National Skyline. After a few listens, Bliss & Death is certainly an improvement upon the last few releases from Garber and I hope it keeps growing on me, but next time he should bring collaborators on board at the beginning of the process. Hopefully that won’t be in 2017. I'm starting a new feature called The Haul in 2009 in which I document all of the music I purchase during the year. It should help me keep Record Collection Reconciliation alive with my already existing records, which was the original intent, and help me keep track of just how much music I purchase in a calendar year. (Must block access of this meme from my wife.) While the following records won’t count for the 2009 tally, I’d feel amiss if I visited Amoeba Records in Los Angeles (which I did two weeks ago) and didn’t recap my finds. Even though I’d tempered my expectations for visiting Amoeba, it was hard not to be excited to enter such a huge record store and then feel a bit disappointed when I encountered the picked-over stock. Nearly every artist I looked for had their own plastic divider but no LPs to earn it. Granted, I didn’t have the necessary time—a half day, perhaps—to fully go through all of their seven-inches and their dollar-bins, but my educated guess is that their employees and patrons don’t let too many great finds slip through the cracks for long. I still need to go to the more heralded Amoeba locations in San Francisco with a weekend to kill, but that’ll have to wait for another cross-country flight. Wire - Object 47 2LP: While this album was a slight let-down after the excellent Read & Burn 3 EP, my Wire fandom compelled me to buy this 2LP package that contains both releases. If the entire album was as good as its bookends—the overwhelmingly catchy “One of Us” and the thrashing “All Fours”—I’d sing a different story, perhaps one about how revitalized they are after the departure of Bruce Gilbert, but the blunt truth is that Object 47 is somewhat more listenable than Send, but far less challenging. Matthew Robert Cooper - Miniatures LP: My copy of the Eluvium box set should arrive shortly into the new year, but it does not contain a copy of Cooper’s “solo” debut from this year, which I’d put off mail-ordering direct from Gaarden Records. I assume that it was grossly overpriced at $20, but I opted to buy it anyway since I’d never seen it in a store. Amoeba was exceptionally good at having recent releases in stock, even if they were a buck or two more expensive than I expected. …And You Will Know Us by the Trail of Dead - …And You Will Know Us by the Trail of Dead LP: After trying out the Festival Thyme EP, I found myself revisiting some of Trail of Dead’s earlier songs. I realized just how good the lengthy, drifting Jason Reese songs like “Novena Without Faith” and “When We Begin to Steal” from their self-titled debut were. Even though it was released on the now-defunct Trance Syndicate imprint, it doesn’t look like this LP is particularly hard to come by, but I was still excited to see it. I’d rather pick up old Trail of Dead albums than new ones. M83 – Run Into Flowers LP: Despite their presence on year-end album lists, M83 works best as a singles band and “Run Into Flowers” was their first great single. The three remixes on this LP are all excellent, taking different approaches (glitch-pop, cresting shoegaze, vaguely hip-hop) to reworking the song. If only they’d put the three or four good songs from Saturdays = Youth on a 12”. What I Left Behind: I mainly passed on new LPs that I thought I could find at Newbury Comics or order from Parasol, like Gregor Samsa’s pricey 2LP for Rest and the reissue of Low’s Songs for a Dead Pilot EP, but I think there were a few other notable declines. Rapeman’s album and EP were both there, although neither is particularly hard to track down, and an EP for the Mekons’ “Empire of the Senseless” was there, although a bit too expensive for my tastes. I was surprised to see a copy of the Comsat Angels’ Sleep No More on LP for $4.99, but I already bought mine from Mystery Train earlier this year. Next up are visits to two Reckless Records locations in Chicago later this week. I am foaming at the mouth in anticipation. 2008 has been a disappointment musically, something I’ve noticed as I’ve struggled to cull together twenty solid candidates for my usual year-end list. I’ve tried my best to stay on top of things, as documented by this list of some of the albums I’ve checked out recently, but it’s hard to say whether many of these will make the final list. …And You Will Know Us by the Trail of Dead - Festival Thyme EP: To say that the Trail of Dead had lost the plot since 2002’s excellent Source Tags & Codes would be a vast understatement. I remember listening to Worlds Apart and thinking “This has to click at some point, right?” before recognizing that it had three good songs, tops, and suffered from an overblown rock opera fetish. (Is there any other kind of rock opera fetish?) I don’t think I’ve ever heard So Divided in its entirety; simply nothing that I’ve heard from that record appealed to me in the slightest, not even the cred-grab of the Guided by Voices cover. Yet I checked out the ill-titled Festival Thyme EP out of morbid curiosity and was marginally encouraged by the results. They’re still appropriating too much 1970s prog-rock without the requisite spirit of adventure or the sense of danger of their own early material, but at least these songs have melodies and some forward momentum. “Bells of Creation” backed with “Inland Sea” would make a good single, although the four-song picture disc ten-inch is a reasonable alternative if you’re fond of Warcraft. It’s no surprise that the nasal whine of Conrad Keely has wholly supplanted the evil Bono pipes of Jason Reece and the faux-British sneer of former bassist Neil Busch, but I still long for those other voices. Festival Thyme is a minor step in the right direction, but I don’t know if they’ll ever equal the combination of melodic indie rock and barely controlled abandon from their self-titled debut, Madonna, and Source Tags & Codes. Aidan Baker & Tim Hecker - Fantasma Parastasie: Nadja’s Radiance of Shadows made my top twenty list for 2007, but none of their 2008 releases (that I’ve heard, at least) has equaled the scope or depth of that release. It’s not for lack of trying, with eight releases coming out during this calendar year (including two following their strange penchant for re-recording their old albums), but Radiance of Shadows’ doom-metal Codeine approach still lingers with me. As if those eight releases weren’t enough, Nadja guitarist Aidan Baker also collaborated with fellow Canadian Tim Hecker for Fantasma Parastasie, which combines the electronic drones of Hecker’s excellent 2006 album Harmony in Ultraviolet with Baker’s guitar feedback to great effect. There are hints of Nadja’s signature menace on “Skeletal Dane,” but the crushing waves of distortion that highlight Thaumogenesis and Radiance of Shadows are nowhere to be found. The balance between Baker and Hecker is remarkable; some beautiful moments peak out from the haze of Baker’s guitar during “Dream of the Nightmare” and “Auditory Spirits.” It’s a solid listen, but whether it measures up to the evocative thunder of Radiance of Shadows has yet to be determined. Benoît Pioulard - Temper: I fully expected this album to be one of my favorites of the year, given my ongoing fondness for his 2006 album Précis, but I keep coming away from it feeling underwhelmed. Sure, “Brown Bess” and “The Loom Pedal” equal the previous album’s highlights (“Triggering Back,” “Sous La Plage” and “Ash into the Sky”), but the novelty of his formula—bedroom singer/songwriter material treated with IDM textures alternating with sound collages—isn’t delivering the same punch this time around, despite more fleshed-out structures for the “real” songs. It’s still plausible that I’ll put it on and it’ll hit me differently, but I’m beginning to doubt the likelihood of that happening. Don’t let this stop you from picking up the 2LP set of Précis and Temper, which invalidated my begrudging CD purchase of the former upon its release. Lukestar - Lake Toba: I heard “White Shade” on the Flameshovel site and then tracked down their web site since I couldn’t determine if it was a male vocalist or not from my brief, verse-only spin. After finding their astonishing promotional photo (there’s a dead ringer for Jim Carrey in this band, for starters) and confirming my suspicion of “high-pitched male vocalist,” I watched the video for “White Shade” on YouTube and tracked down the Norwegian group's newest album. I can’t say that I understand the post-rock tag that’s floating around in reviews and press clippings, since they’re basically doing catchy, slightly off-kilter indie rock with falsetto vocals—i.e., something that fits in perfectly on Flameshovel, their American label. Closer “Peregrin” and the aforementioned “White Shade” are highlights, but the falsetto wears thin on some of the poppier tracks. Marnie Stern - This Is It and I Am It…: I view making it through almost all of this record without itching to stop it—after several failed attempts—as a monumental achievement, one I’m unlikely to repeat. This Is It… is nowhere near as spazzy or Deerhoof-derived as her debut, which is a huge step in the right direction, but Stern’s still a highly idiosyncratic artist and too many of those idiosyncrasies irk the hell out of me. She’s made significant progress with her vocal melodies, but it’s easy to overdose on chirpy exuberance. Similar to my dreams of In Advance of the Broken Arm magically reappearing as a four-song EP, I’ll condense This Is It… to “Ruler,” “Transformer,” “The Crippled Jazzer,” “The Package Is Wrapped,” and the verses of “The Devil Is in the Details.” I can’t bring myself to say that I’d prefer an album of comparably more straightforward songs like “Every Single Line Means Something,” since I can appreciate what Stern’s doing in the songs I didn’t mention, but it’s a clear case of appreciation trumping enjoyment. And since I’m not getting paid to review records, I’ll stick with enjoyment and the pared-down LPs.